Call it a badge of honour or a gross gender imbalance, the fact remains that Jane Campion is the only woman director to have won the Palme D’Or in the 60-year history of the Cannes Film Festival. She was awarded the prestigious prize for The Piano, a seriously evocative film redolent with breathtaking imagery and tragic romantic themes. Southern belle Holly Hunter is haunting as the wilfully mute Scottish heroine Ada McGrath who is sent by her father to colonial New Zealand to marry a man named Stewart (Sam Neill) sight unseen. Accompanying her on the journey is her spritely daughter Flora (Anna Paquin) and her treasured Broadwood piano. But from the moment the trio is left stranded like a tiny pod of whales on a deserted South Island beach, one can sense trouble brewing. 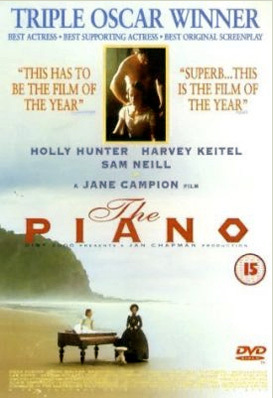 It’s all sparked off when Stewart trades Ada’s piano to George Baines (Harvey Keitel), a mysterious figure whose allegiance to the Maori is displayed by the traditional moko tattooed across his face. In a desperate attempt to retrieve her primary means of expression, Ada enters into a bargain with Baines that has dangerous sexual strings attached and the passion that is subsequently unleashed goes way beyond your average bodice ripper. Currency Press has just published an absorbing monograph on the film written by Gail Jones who posits the idea that The Piano is the first film in which a woman is pleasured before a man – a point that has no doubt contributed to it being a particular favourite among female viewers. However the Academy Awards bestowed on it for Best Actress (Hunter), Best Supporting Actress (Paquin) and Best Original Screenplay (Campion) attest to its universal appeal. Add Michael Nyman’s magical score and you’ve got a real master – or should I say ‘mistress’ – piece.